Take your Russian to the next level! Learning Russian will broaden your social circle significantly because more than 250 million people speak this language worldwide! Some of the greatest literary works were written in Russian, which means that if you want to read the masterpieces of Dostoyevsky or Tolstoy in original, you will have to work on your Russian vocabulary. Those whose passion is history will be fascinated by the old Communist monuments, food lovers will find things to enjoy in the Russian cuisine, the Russian culture is truly magnificent but can be fully understood only by learning the Russian language. Are you ready for this captivating journey? Learn to speak Russian with VocApp! The Russian lessons and online Russian courses we prepared are a perfect way to conquer this language! We use special flashcards that assure you understand and remember all the new Russian words! You can learn Russian fast with our Russian vocabulary lists that include the most common and vital words. We add Russian words translations, example sentences for you to learn some of the Russian grammar and of course Russian pronunciation to each of the flashcards. All the resources you need have been prepared, don't hesitate to start! We gathered the most common adjectives in a course, with their Russian to English translation and many details on the meaning and use of adjectives. The adjectives in Russian will help you express yourself in a more detailed and interesting way. The list of adjectives will be useful in describing things that surround you. This Russian course will also teach you the Russian adjective endings, that are crucial if you want to learn to speak Russian the right way. You can download these common adjectives as a Russian audio lesson and learn them on the go! 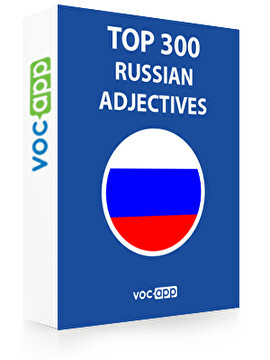 We advise to proceed to the other courses and Russian language lessons we've prepared, for example Russian Words: Top 1000 Nouns and Russian Words: Top 500 Verbs will teach you the common nouns and verbs to enhance your Russian vocabulary.Learn Russian with VocApp and be proud of your results!